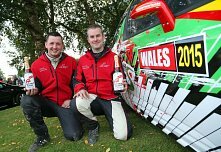 The winner of the 7 round series will secure a fully funded drive in a Citroen DS3 R3 for Wales Rally GB, Britain’s round of the World Rally Championship in November 2015. Jon Armstrong made it three wins from three starts on Saturday’s Bushwhacker Rally – but it wasn’t enough to deny Rob Duggan from being crowned the Carryduff Forklift Road To Wales champion. 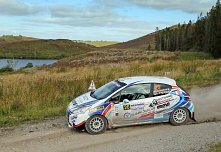 Duggan and team-mate Ger Conway’s reward for clinching the overall title is an all-expenses paid drive on November’s Wales Rally GB in a Citroën DS3 R3 prepared by David Greer Motorsport. After six action-packed events and hundreds of stage miles, the race to be crowned the Carryduff Forklift Road To Wales champion will go down to the final round at the end of this month in Omagh. 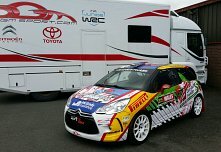 Any one of three people can still win the biggest prize on offer in Irish motorsport this year: a free entry and fully-funded drive in an R3-specification Citroen DS3 for November’s Wales Rally GB. For further information and media enquiries please contact the championship coordinator Raymond Moore raymond@rr-ni.com.